What triggered the most recent evolution of bed bugs? The modern bed bug evolved from flying insects similar to the mosquito. This was most likely an adaptation to changes in the environment, called an adaptive radiation. Scientists have found fossils of bed bugs dating back to 1500 BC, and they were well-known and documented in ancient Egypt and across the Roman Empire. Indeed, even Aristotle mentioned them in ancient Greece some three hundred and fifty years BC. Bed bugs have been a major topic in the media since their most recent evolution and significant resurgence in the last few years. Lots of people have probably read already that they have evolved unique mechanisms to resist even the most advanced active ingredients used by professional pest controllers. These blood-feeding insects have recombined markers in their DNA structure to develop quicker metabolisms, thicker outer shells, and can enter states of full and semi-hibernation, allowing them to survive in certain conditions even when poisoned. Their senses have also improved making it possible for them to detect certain body odours and recognise our luggage, which is now the main reason for the introduction of bed bugs at our properties, arriving home with us after a holiday. During the 1940’s and the 50’s, before the evolution was triggered, bed bugs were successfully treated and nearly vanished globally, thanks to the widespread use of the most common insecticide back then – the infamous use of DDT. This pesticide took a vital role in tackling various insect related issues across the world but it had a negative impact on the environment and decimated beneficial insects such as the pollinators, leading to the global banning of DDT in the 1970’s. In the past six to seven years we have been steadily researching and gathering data. We have gleaned this from bed bug cases, pest control business owners abroad and people from various backgrounds and places internationally. We have concentrated on data regarding the history of DDT and the outbreaks of bed bugs in the past. Having successfully run Bed Bug Hunters for quite some time now, our director Blago Manov has come to a conclusion as to the trigger for the recent evolution of bed bugs. Our hypothesis is that bed bugs did not evolve on the basis of building up resistance to the DDT by recombining their DNA structure. 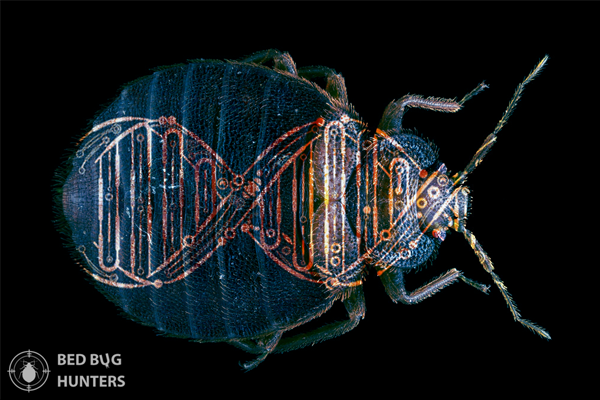 There is evidence of a more comprehensive evolutionary process, since bed bugs evolved not just one but several defence mechanisms and improved as a species. Bed bugs evolved due to the mass extinction threat during the 1940’s and 1950’s and the fact the they were nearly completely eradicated. Most likely, this triggered the change in the biological algorithm or ‘software’, which is a goal-oriented process of initiating intelligent design changes. This helps to transform the physical body and improve its functions. The process also depends on input from the environment, which must be processed successfully by the biological ‘software’ for the evolutionary process to succeed. That means that bed bugs most probably evolved most around the 1960’s but it took some time for these evolutions, or mutations if you prefer, to reach a stable state. We believe that the evolved bed bugs coexisted with the old bed bugs for some time. The current outbreak, 3-4 decades later is mainly because of the steady surge in the number of people travelling abroad for business and leisure. If we compare the evolution process and insect intelligence with the Artificial Intelligence, (AI), that we are developing now, the insect brain is much smarter than machine intelligence. Currently, scientists are researching ways to improve the machine learning process, while studying the insect brain structure and functionalities. Insect intelligence is worth billions of years of evolution and AI could only learn from mother nature. In the future we will probably see conscious robots and intelligent machines optimised by the brain patterns of insects studied in the laboratory. Hopefully the study of the incredible efficiency of the insect brain will serve our society well, helping us to preserve the flora and fauna of our world increasingly well.